Back in March, Robert Montgomery unveiled Hammersmith Poem, an extraordinary, public-facing installation set across the iconic brutalism of Hammersmith Town Hall. Clocking in at six metres tall, it was both a sprawling ode and impassioned rallying cry, dedicated to a school of civic values he felt that the world had stopped believing in: Modernism. Building on the aforementioned, the Scottish artist and punk poet (best known for his monumental billboard works) has announced a major new exhibition, aptly titled Hammersmith Poem and Love Letters to Kazmir Malevich. 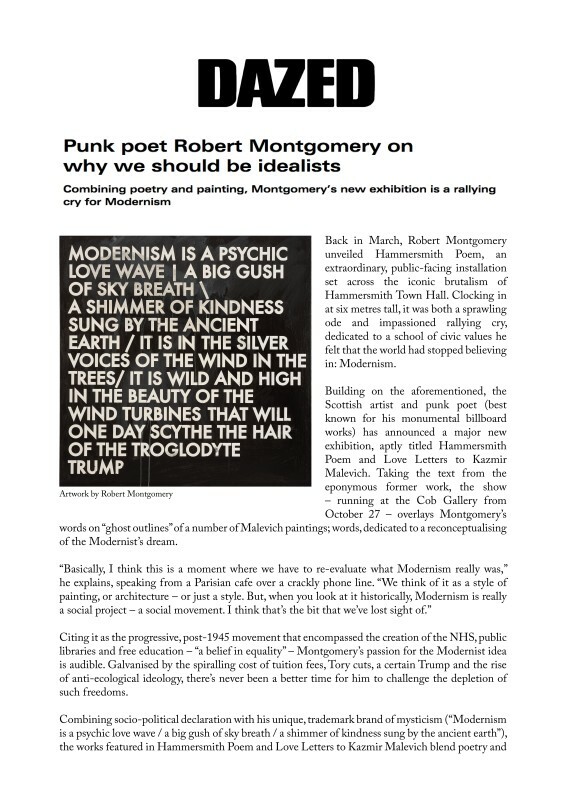 Taking the text from the eponymous former work, the show – running at the Cob Gallery from October 27 – overlays Montgomery’s words on “ghost outlines” of a number of Malevich paintings; words, dedicated to a reconceptualising of the Modernist’s dream.